The Hovercraft is an amphibious vessel that can venture where no other boat or vehicle can go. It is uniquely equipped to travel across water, mud or even land! This authentic buildable military vessel measures 13.75” wide, 21.5” long, and 11.5” high and is powered by rotating fans and propellers. 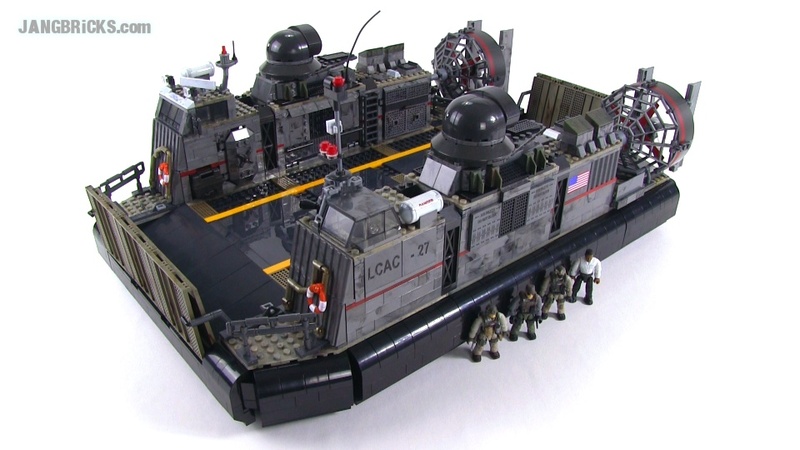 It features multiple opening compartments like the armory and engine rooms and a chain accessory to anchor other builds to the hull. The Hovercraft has a landing dock that opens and closes, creating a ramp to the mainland for transporting vehicles, personnel, equipment and supplies. It comes with four highly detailed and poseable micro action figures with interchangeable surveillance accessories. Establish a mobile command post and recreate an epic battle scene! I am not complaining, but I am just wondering if you will be doing that halloween display kind of thing in yoir park like last year? You did it last year and said you would do something like that for christmas but never did so I did not know if you were going to do a Halloween one again.